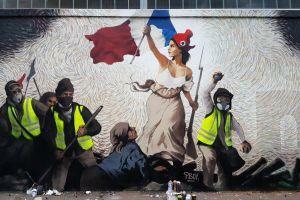 The mural is a play on the iconic Eugène Delacroix work Liberty Leading the People and shows Lady Liberty leading a group of Gilets Jaunes protesters into confrontation as she holds the French flag in the air, and is the work of artist Pascal Boyart, who is often dubbed the French Banksy (a famous anonymous England-based street artist.) Hidden inside the mural is the private key to the prize, to which anyone can donate to increase the amount, but not everyone can participate: Boyart told his Twitter followers that they would need to physically be in Paris and actually in front of the mural in order to take part in the hunt. The location, which had not been disclosed previously, has been discovered by Twitter user @TZTaughtMe, who claims to be the first person there, later joined by two journalists who were not participating in the treasure hunt. The hunt officially began around 12 hours ago, when Boyart both tweeted and posted his artwork to Reddit. In the comments to his official Reddit post, he revealed that people who cannot physically be there can still solve only a part of the puzzle from behind their computer screens. One significant difference between the mural and the piece it was inspired by is the fact that Boyart decided to forego showing Lady Liberty’s breasts, instead painting a sort of bra over them. This led some in the community to speculate that this is where the puzzle’s solution could be hidden, accessible by removing part of the painting with acetone or similar chemicals. Still, many others hope that there will be no need to alter the panting to solve the puzzle. This is not the first puzzle to feature a reward in crypto. Several have already risen to prominence, and perhaps the best-known among them is The Legend of Satoshi Nakamoto, a visual puzzle associated with the Bitcoin address 1FLAMEN6 that was created in 2015 with 5 BTC locked in. It was finally solved three years later, having previously been dubbed “fiendishly difficult”, by a programmer who hadn’t even heard of it until a month before finally cracking it.